Donnie Junior is going to prison. The Russian lawyer who met with Donald Trump Jr. last June has changed her story and now says he asked for documentation of her Clinton allegations and said they could look at repealing the Magnitsky Act if his father won the election. Since it’s known the lawyer, Natalia Veselnitskaya, has close ties to the Kremlin, an eyewitness story describing the offer of a quid pro quo will have legs. Has Putin decided Trump is too hot to be useful? Meanwhile, Martin Longman has an interesting theory that I agree with on why Paul was attacked in the first place, and why he and the conservative media are not making a big deal about it, and why his attacked was only charged with a misdemeanor given the serious injuries suffered by a US Senator. President Trump said that guns were not to blame for the mass shooting at a church in Sutherland Springs, Texas, on Sunday. Speaking to reporters in Japan during the first leg of his trip through Asia, Trump adopted a familiar GOP mass-shooting talking point. “I think that mental health is your problem here,” Trump said. “Based on preliminary reports, a very deranged individual, a lot of problems for a long period of time.” “This isn’t a guns situation,” Trump added. Yeah, just like a hurricane is not a wind and water situation. “House Republicans’ tax bill would increase taxes for 12 percent of Americans next year, according to a new report from the nonpartisan Tax Policy Center. By 2027, at least 28 percent of Americans would see their taxes rise, the report says. Many of those taking a hit would be people who make less than $48,000 a year,” the Washington Post reports. “A group of Democratic senators is set to huddle with a top White House official to discuss potential changes to the Republican tax plan Tuesday,” the Washington Post reports. The Democrats include Sens. Joe Manchin III (WV), Heidi Heitkamp (ND) and Sherrod Brown (D-OH). “A record number of people signed up for Obamacare in the first few days of open enrollment this year compared to the same period in previous years,” The Hill reports. A new CNN poll finds just 36% say they approve of the way President Trump is handling his job, worse by one percentage point than his previous low of 37%, reached in October. Disapproval has also reached a new high at 58%, with 48% saying they strongly disapprove of the way he is handling his job. Also interesting: 59% say they think Trump himself knew that his campaign had contact with suspected Russian operatives. 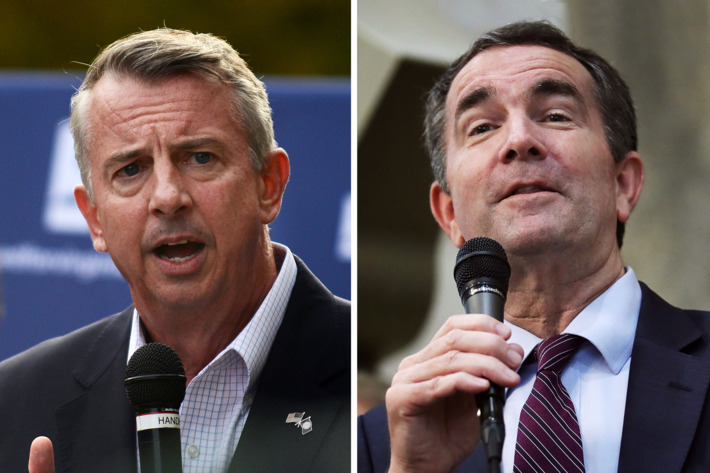 Well, it’s all eyes on Virginia today, going racist has benefitted Gillespie greatly proving yet again racism is still a powerful force in America. But what really interests me is Rand Paul and the mystery of the rich neighborhood throw down that resulted in 5 fractured ribs. Get the distinct feeling we’re only getting a part of the story and it’s deliberate. As for Manafort who cares? The real game is who’s up next to be indicted, smart money says it’s Flynn & Son. I remember the Nixon era well, seems it’s moving along at a rapid clip at this point. Speaking of Nixon I believe it’s the only reason Trump has not yet had the nerve to fire Mueller. From my minority viewpoint, Democrats cannot begin to make crossroads into this election cycle until we explicitly acknowledge the identity political elephant in the room. It has always been here, will always be here and IMO this elephant needs to be faced head-on and acknowledged. Building a wall . . . or using E-verify and fining employers = the same end result. Let’s not kid ourselves as Democrats – – identity politics of people of color is here to stay because it never went away. We need to stop marginalizing the many different viewpoints in our own party. I feel like I should have taken the day to run down to VA to help. Did phone banking from my house the last two nights and have been following the progress of the Dem canvass. Read someplace that’s the VA Dems knocked on more doors this past weekend than they did before the 2016 general. I’m really proud of every one working so hard on this. And Tom Perrello is probably the MVP for canvassing. Hoping their work pays off. OMG! OMG! I just came from a neighborhood meeting trying to decide if I should tune in our shut it down and wait for the morning….. Awesome. I’m still traumatized by last November, so I haven’t been watching TV. 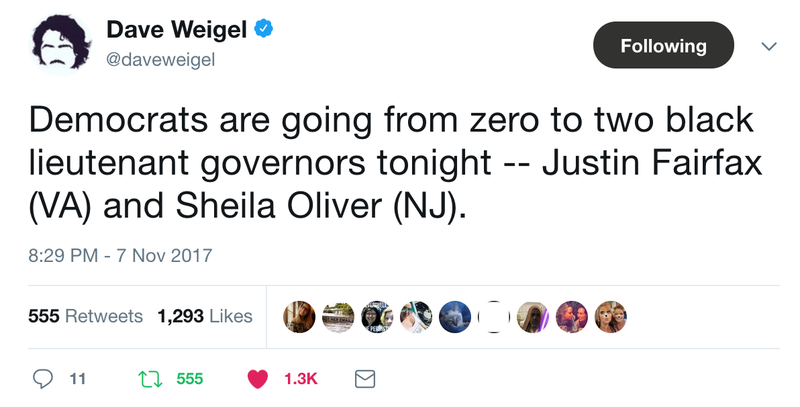 Lots of Dems winning tonight, J. An amazing night for sure, including a trans gender woman elected to the Virginia house. I’m relieved and pleasantly surprised.